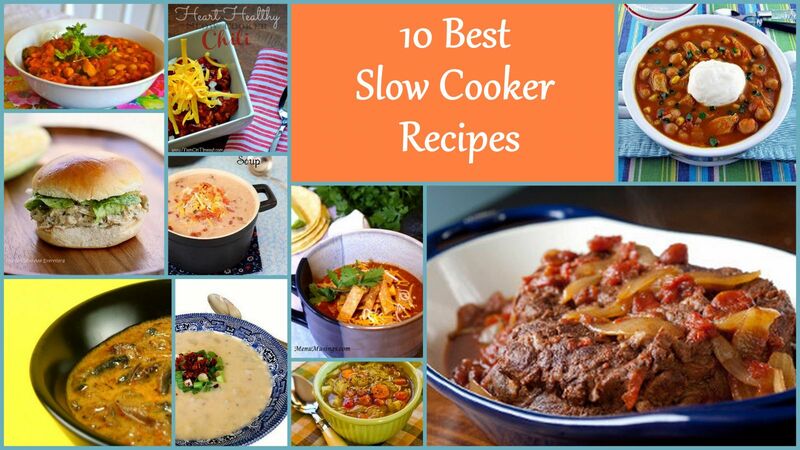 Here are the 10 Best Slow Cooker Recipes for you and your family. These recipes will change the way you cook dinner. Each amazing slow cooker recipe is full of flavor and will satisfy even the hungriest of eaters. The best part of these recipes is that you just throw all ingredients into your Crock Pot and then let it do all the work. You can now serve delicious, filling meals to your family and friends with little effort. If you're feeding a crowd or just your family on weeknight, use one of these recipes and make everyone happy with these delicious and awesome slow cooker recipes. 1.Slow Cooker Pot Roast with Tomatoes - This is the perfect hearty meal that will satisfy even the pickiest eaters. You cannot go wrong making this slow cooker recipe for your next dinner. The mix of beef with tomatoes, onion, and chipotle will make anyone's mouth water. It is a simple slow cooker recipe that makes an outstanding dinner. This is a must-try Crock Pot recipe that is very enjoyable. 2. Cheesy Mushroom Soup - There is nothing better for dinner than a warm bowl of soup. This easy, slow cooker soup recipe is perfect for a cold night. The Cheesy Mushroom Soup is creamy and satisfying. It will fill up even the hungriest of eaters. Its creamy cheese is melted and mixed with veggies giving you a delicious and nutritious meal. You will love how easy and simple cooking this mushroom cheese soup really is. Simply grab your Crock Pot and start cooking your warm, flavorful soup. 3. Easy Baked Potato Soup - Cooking baked potato soup cannot get any easier than this recipe. This is a must-try Easy Baked Potato Soup that is creamy and delicious. This amanzing slow cooker recipe cooks the soup in a Crock Pot making it one of the easiest soups you can make. Throw all the nutritious and tasty ingredients in your Crock Pot and you will have a satisfying meal that the whole family can enjoy. If you are looking for a great dinner idea, look no further and try this soup today. 4. Easy Slow Cooker Chicken Tortilla Soup - This is a great soup slow cooker recipe that is very flavorful. It is an easy tortilla soup recipe that will keep you satisfied. Its fresh ingredients and delicious spices give this soup an outstanding taste. The best part about this soup recipe is that it cooks in a slow cooker. Simply prepare the ingredients and then let the slow cooker do all the work. You now have the perfect weeknight dinner that will put a smile on everyone's face. Try making this chicken tortilla soup recipe tonight. 5. Ham and Cabbage Soup with Red Bell Pepper - This awesome slow cooker recipe is not just for those following the cabbage soup diet. This is for everyone looking for a simple and fantastic vegetable soup. Try this low-cal, low-fat Ham and Cabbage Soup with Red Bell Pepper today. 6. Heart-Healthy Chili - Looking for a good chili recipe? Well, we got an award winning chili recipe that cooks right in a slow cooker. You will love the taste of this warm chili that is bursting with flavors. It's made with whole ingredients giving you a heart-healthy recipe. This recipe is easy and delicious to make. It is perfect for a weeknight dinner or when you’re expecting a large crowd. You can always count on this Heart-Healthy Chili recipe to be a family favorite. 7. Jalapeno Popper Chicken Chili Soup with Bacon - If you're a fan the classic jalapeno popper appetizer, you'll love the flavors that come out of this Jalapeno Popper Chicken Chili Soup with Bacon. It's creamy, it's thick, and it's packed with awesome cheesy flavor. And, as an added bonus, you get your protein in with big chunks of chicken breast. This is a great slow cooker recipe for game day grub or for parties during the fall and winter months. Cook it up in your slow cooker. 8. One Pot Chicken Caesar Sandwiches - What will the slow cooker come up with next? They're still great for making soups and stews, but now you can also make One Pot Chicken Caesar Sandwiches. This is a fantastic slow cooker, one pot meal that whole family will enjoy. This is a must-try Crock Pot recipe that you will love. 9. Pumpkin Chicken Chili - This is one of the most unique slow cooker chili recipes we've found. Pumpkin Chicken Chili is smooth, rich and has a ton of nutrition. You can toss this entire recipe in the slow cooker and come home to the aroma of a healthy and satisfying meal. This awesome slow cooker recipe will be a hit with the whole family. 10. Slow Cooked Chili Beans - The best part about this recipe for Slow Cooked Chili Beans is that it shows you that some of the tastiest healthy slow cooker recipes don't need to have meat or grains in them to be good. This is one of the most flavorful bean recipe you can find. It is easy and delicious. You will not regret making these cooked chili beans. Try this awesome slow cooker recipe today.